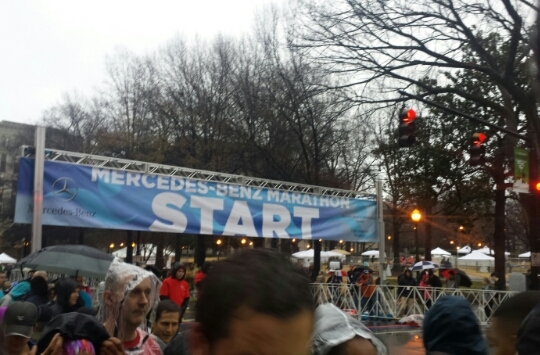 Day 3: Mercedes-Benz Marathon Weekend. My alarm was set for 5:00 a.m. I woke up 15 minutes earlier feeling refreshed after two days of recovery from my last run. The first thing on my mind was the weather. The forecast changed so many times leading up to the Mercedes-Benz Marathon weekend. To be on the safe side, I brought 3 coordinating sets of running gear. I was pleased to see that the winds were low and the temperature was in the low 50°s. I didn’t mind the light rain. To run in 50° after my recent 20° training runs was a treat. I wore a jogging suit to the start to peel off as I warmed up. The race directors organized a sweep of discarded items to donate to local shelters. Parking was easy to find, and I got a spot outside the Alabama Sports Hall of Fame. I walked around the convention center to the Sheraton Hotel. There were a lot of runners making last minute preparations. It was a convenient time to use the restroom. I am glad I stopped, because the porta potties had a long line. The Sheraton had a table full of bananas and a lot of staff to assist with the crowds. It was less than 10 minutes from the 7:03 a.m. start time. 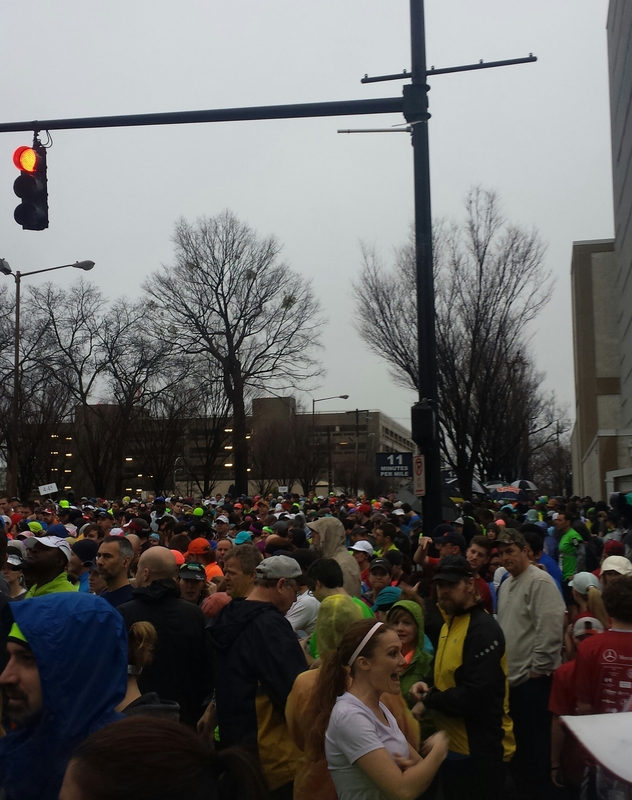 It was so crowded in front of Boutwell Auditorium with spectators and runners trying to get in the corrals. 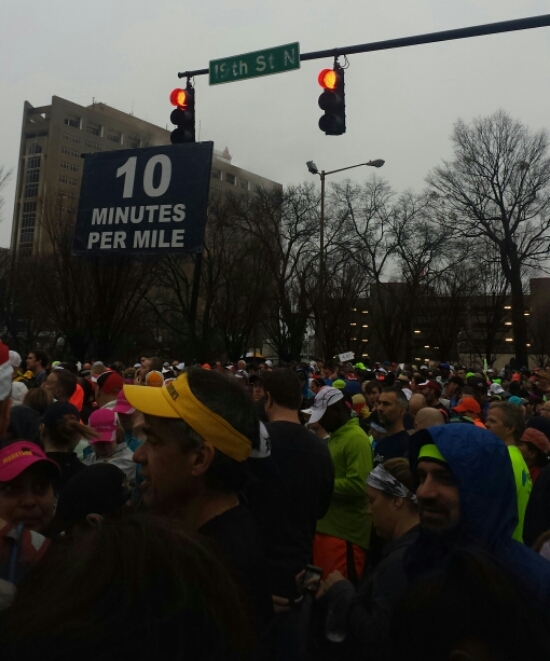 I saw a break around the 10:00 mile pace. That was OK with me. I needed to get my music together, take off my sweat pants and pick up a GPS signal. 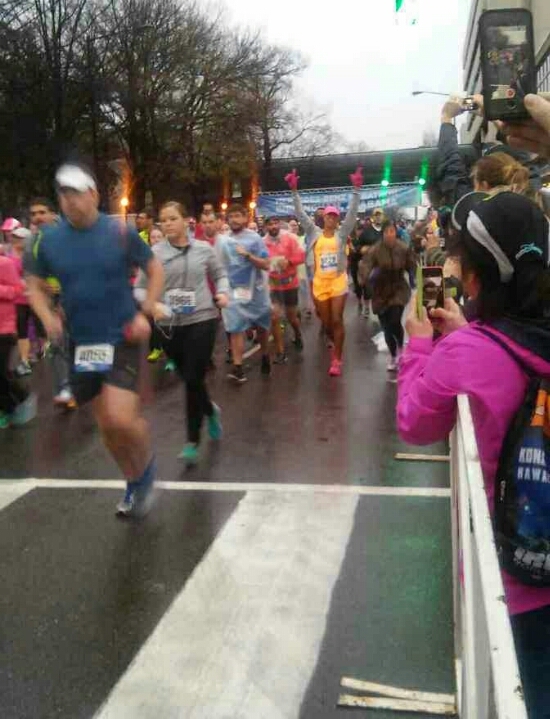 I thought a lot of the runners were over dressed with compression socks over tights and jackets with trash bags and rain coats. The rule of thumb is dressing for the outside temperature plus 15 degrees. 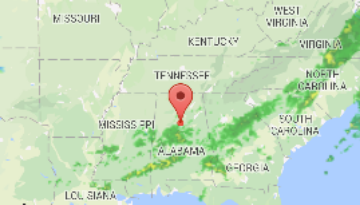 The race announcers made a comment that the rain would stop in five minutes. I believed him. Unfortunately his declaration was untrue. 7:03 hit and the runners slowly made their way towards the start timing mats. The field was shoulder to shoulder crowed. I saw Nylia and waved. It would be almost 2 hours before we would meet again. I did a lot of weaving in and out for the first quarter mile. The humidity allowed me to warm up very quickly and I tossed my jacket to the side with a wish it would be matched with the pants I left at the corral. There was a slight bunny hill that was just enough to wake up my legs. I had to remind myself that I read reviews about this race having hills. If the remaining hills were like that bunny hop I would be in great shape. By the first half mile I felt like I could run a straight line with out bumping into someone. It was still crowded but not too bad. I passed the pace 4:15 pace group. I was glad I wore gloves and wondered when I would take them off. They provided comfort, so I decided to keep them on. The first water stop was at 1.5 miles. I normally do not take a sip that early, but I knew the rain could be deceiving as far as hydration needs. The rain continued and got a little heavy at times. The back of my socks were wet and my toes felt a little moist. The rain felt good against my arms. I could see my skin through my shorts and wondered if I was flashing everyone behind me. Maybe I should have worn black like the majority of runners. Oh well. All of my shorts have build in liners. I continued to take drinks about every other mile. The volunteers were awesome. At one stop I grabbed a lemon lime drink instead of water. That may have been a good thing because the humidity was so opposite of the crisp air I have been training. Although my body was warm I could feel the drop in temperature as forecasted. I was glad I didn’t toss my gloves. The hills started around mile 6. I played a little game. On the inclines I said, “The hills are calling.” When I reached the peak I said, “Answer it” and powered through. 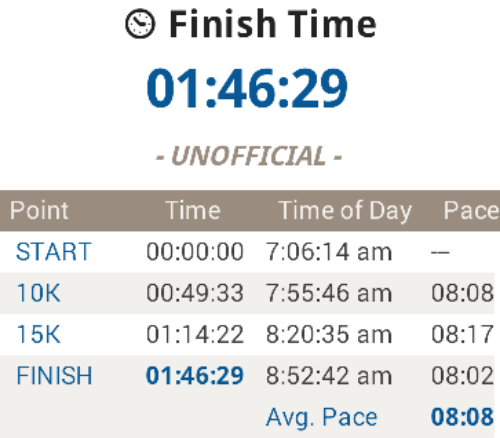 I passed the 4:00 marathon pace group. I entered the 5 Points South intersection which was familiar from my visit to the Vulcan Statue. There were a lot of spectators. This area reminded me of the Highlands in Louisville and Royal Oak, MI. It was no coincidence that the street is called Highland Ave. This is where the fun began. On the course map there were supposed to be 3 parks during this stretch. I made up a mnemonic of CRR for Caldwell, Rhodes and Rushton park names. They must have been very small because I did not notice them. I knew there would be Vanilla Gu at mile 8. The Gu stop ended up being around mile 7 and it was Strawberry Banana. It was better than nothing. I only used a dime sized amount. Beyonce’s “7/11” was the perfect time to put mile 7 behind me. At mile 9 there was a lovely downhill along the golf course. The relay teams were lined up and cheering for everyone. At this point I just wanted to finish strong. The rain finally stopped and my shorts were beginning to dry. I wasn’t losing the gloves though. They came in handy after a few spilled drinks. Sticky hands are so annoying. The small pebble in my left shoe was working my nerves too. After mile 11 there was a split to keep the full marathoners on the right side of the road, because this was a double loop course. I pushed myself and ran negative splits for the last three miles. Mile 12 was my fastest at 7:45. 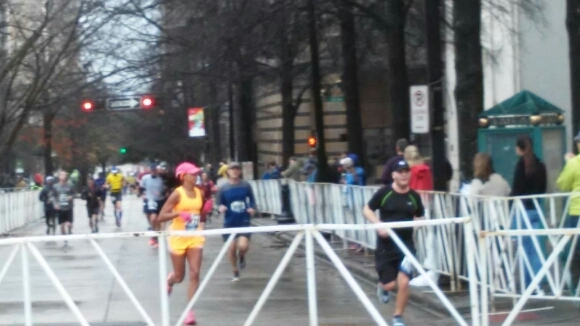 I passed the 3:45 marathon pace group. I recognized the same finish area as the Superhero 5k. Nylia said she was yelling for me but I didn’t hear her. Mobb Deep “Shook Ones” was blasting in my ears. I did hear the announcer say, “Kelsie Smoot from Louisville, Kentucky” over the speakers. I threw my arms up in victory. The finish area was exactly like the Superhero 5K in Linn Park. There were plenty of snacks. I prefer low fat chocolate milk over powerade, so I picked up a Dasani and Dole fruit cup. The Mercedes beach towels were passed out as we exited the finish area and our bibs were marked. BBQ was the last thing on my mind, so I didn’t use the Nicks BBQ voucher for free food. The plan was to get back to the hotel, stretch in the pool, bathe and rest for a couple hours before check out. #14 out of 341 in my age group. OFFICIAL TIME: 1:46:29 I crushed my personal best which was 1:51:02 at the INDY 500 half marathon. 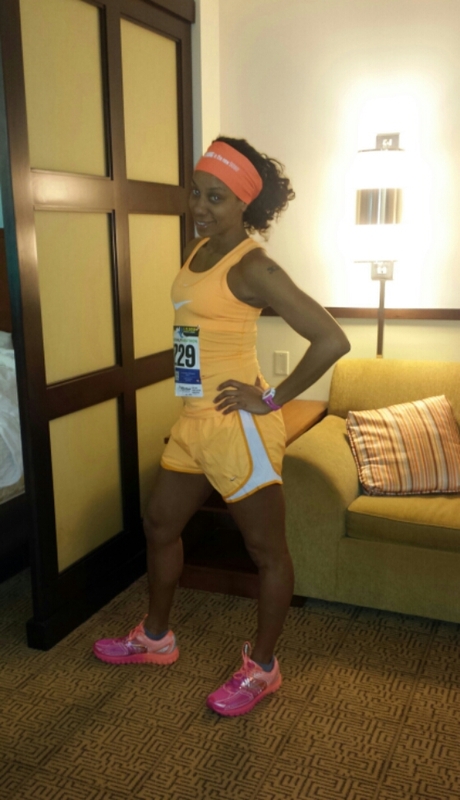 I saw a huge improvement from my first half marathon in 2013 for the Derby Festival which was 1:55:43. I would also like to note that I saw more Blacks at this race than all the races I have done in the last two years combined! Black Girls Run was in full effect. 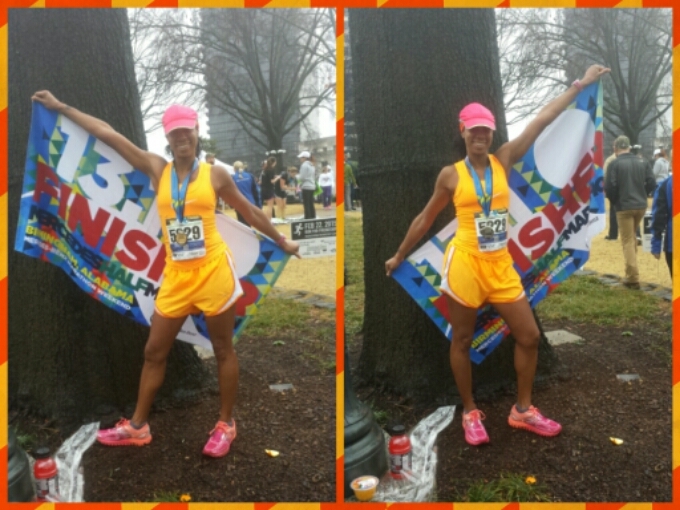 The National Black Marathoner Association was in full effect. I guess that’s how they do it in the South! The Mercedes-Benz Marathon Weekend exceeded my expectations. 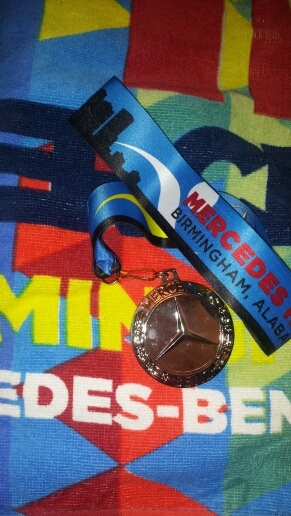 This entry was posted in Alabama, Birmingham, half marathon, marathon, running, Travel and tagged Mercedes benz half marathon. Bookmark the permalink. Thank U! Yeah, all I need is a fat rope chain and I’m styling. Awesome race! Well done on the PR! Thanks Karen. I will check it out! Love the pics, and the fact that your warm up suits were donated. Awesome. Congrats!